This fault code does not light a lamp on the dashboard. It indicates a problem in the preheating circuit. This generic fault code does not specify the exact cause of the problem. The probable cause is a malfunction of the glow plugs themselves. They operate on a simple principle. They are comprised of a heating resistance which, when powered, will heat up the combustion chamber during the first seconds of engine operation to facilitate ignition (Pre-heating) and accelerate temperature rise in it (Post-heating). They can be tested one by one, without necessarily removing them (Fig 2-1). Remove the connector or power wires and test them using a multimeter set to ohmmeter. They usually have a resistance of the order of 0.7 Ohm. Most multimeters are not accurate enough to measure this type of resistance. The display will show a resistance of 1 or 2 Ohm. This is enough to tell if the plug is working. Malfunctioning plugs have cut internal resistance (Fig 2-2 infinite resistance). Dci engines by Renault/Nissan will show a different fault code. 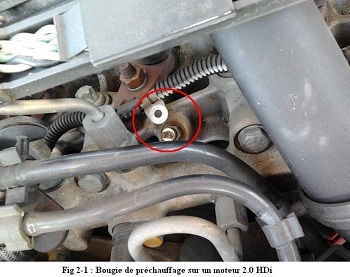 Like for the P0380 fault code, the cause of the problem is not clear. The procedure is the same. First test the glow plugs. If they are in good condition, the second more likely hypothesis is a problem in the relay control unit which powers the plugs during pre/post heating. 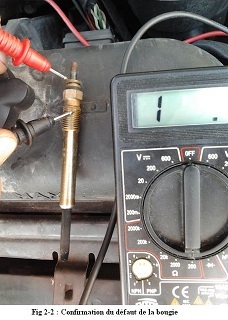 Using a multimeter set to voltmeter, test the voltage across the plug terminals during preheating.